Towering cliffs, waterfalls, deep gorges, peaceful lakes, and beautiful trees and foliage are all found in Hocking Hills State Park Region. Ohio’s Hocking Hills State Park, the state’s most-visited park, features five distinct and amazing areas: Old Man’s Cave, Cedar Falls, Ash Cave, Cantwell Cliffs, and Rock House. Surrounding the park is the Hocking State Forest with rock climbing, rappelling and horseback & ATV riding trails. Lake Hope and Lake Logan State Parks welcome boaters and anglers. Along with the surrounding State Nature Preserves such as Conkle’s Hollow and Rockbridge, Clear Creek Metropark, and Tar Hollow State Park, there is something in Hocking Hills for everyone. You will not be bored or disappointed because there is an abundance of natural beauty and adventure for all to enjoy! 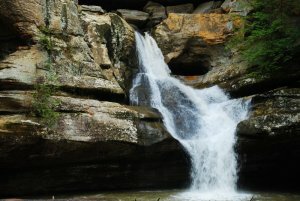 Of course, our Carefree Cabin rentals are just minutes from these Hocking Hills wonders of nature! Where available, we’ve included links to individual park/trail maps below. And here is a Hocking Hills State Park trail map with distances included. Note: Links from this page will open in a new window. Please be sure to disable your popup blocker. Ash Cave is the largest recess cave east of the Mississippi and perhaps the most awe-inspiring feature of Hocking Hills State Park. With a horseshoe-shaped rim that spans 700 feet, with a runoff waterfall, Ash Cave is enormous and open on one side. 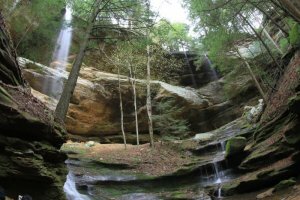 It’s the southernmost of six natural areas that comprise Hocking Hills State Park, and is a must see for all visitors looking to experience Ohio caves. 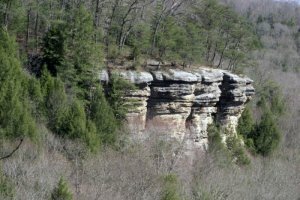 Cantwell Cliffs is in the Northern park of Hocking Hills. Because of it’s location far away from other trails, it is often less frequently visited. Cantwell Cliffs is home to the famous narrow passage known as Fat Woman’s Squeeze and is one of the best trails for photographs. For a breathtaking hike with fewer people, visit Cantwell Cliffs. Among many other amazing features, Cedar Falls is home to the largest waterfall anywhere in Hocking Hills. The trails promise beautiful views of steep rock formations, waterfalls, and laden hemlock. In the mid 1800’s early settlers mistook the hemlocks trees for cedar trees, and hence the name Cedar Falls. 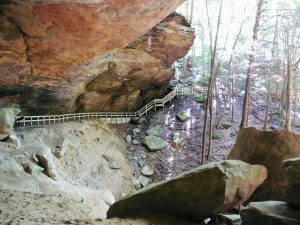 Old Man’s Cave is by far the most popular park and trail in Hocking Hills State Park. With destinations such as Devil’s Bathtub, there is beauty through every step of this park. 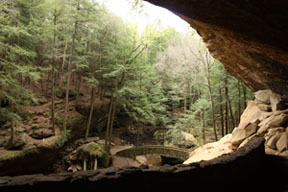 Old Man’s Cave is separated into five regions: Upper Falls, Upper Gorge, Middle Falls, Lower Falls, and Lower Gorge. If you’re only in Hocking Hills for a short time, this is the park to visit! Parking is often in short supply due to the popularity of this park. Rock House is unique and special for Hocking Hills because it is the only actual cave in the park. It features a 200 foot cooridor with 25 foot high ceilings and Black Hand sandstone walls. The rock formations and views at Rock House are northing short of amazing! 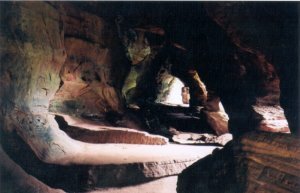 Whispering Cave opened to the public in 2017 and has quickly become a favorite spot of many. The new trail is open year-round from dawn until dusk and is accessible by the Hemlock Bridge trail. The cave itself is almost 300 feet wide and has a gorgeous, 150-foot waterfall pouring from its upper rim. There are guardrails along the edge of the cave for your safety, but there are some low rocks and steep areas. Combined, the trails are 1.2-miles. While Hemlock Bridge Trail is a renovated trail, Whispering Cave Trail carves a completely new .2-mile path through the Hocking Hills region. The trailhead and a map are found at the large wood kiosk at the entrance of the former dining lodge parking lot. Conkle’s Hollow nature preserve is home to one of the deepest gorges in the state of Ohio. While most of the lower Gorge trail is wheelchair friendly, there is a much more adventurous and challenging hike available on the Rim Trail. The rim trail at Conkle’s Hollow is also one of the longer trails available in the area. Be prepared to climb plenty of stairs and traverse some steep inclines! The natural arch or bridge known as Rockbridge is more than 100 feet long and 10 to 20 feet wide, and gracefully arches 50 feet across a ravine. 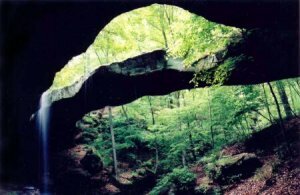 It is considered the largest natural rock bridge in Ohio. Rose Lake is located in Hocking Hills State Park between Old Man’s Cave and Cedar Falls. 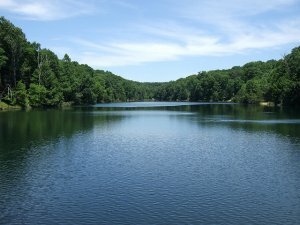 This lake is 17 acres in size, and approximately 25 feet deep at its deepest point. Rose Lake was originally intended as and serves as the park’s water source. But like so may other beautiful things around Hocking Hills, so too is Rose Lake. A deep, cool, and clear lake, it is as inviting to fish as it is to view. Anglers can expect to catch a variety of fish including Bluegill, Channel Catfish, Golden Trout and Rainbow Trout. Location: St Rt 374 about 1 mile south of 664. Look for the “Fisherman’s Parking” sign and walk the 1 mile trail from there. 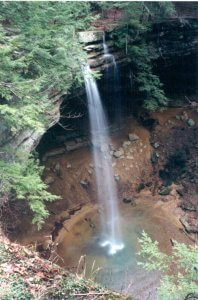 Or, hike from Old Man’s Cave or Cedar Falls using the trail maps as your guide. 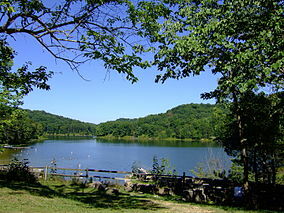 Lake Hope is a 2,983-acre state park located in Vinton County, OH. 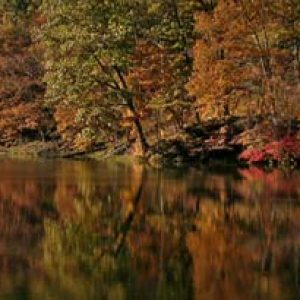 A natural paradise, this beautiful lake lies entirely within the 18,200-acre Zaleski State Forest in the valley of Big Sandy Run. It is a rugged, heavily forested region accented by steep gorges and narrow ridges. 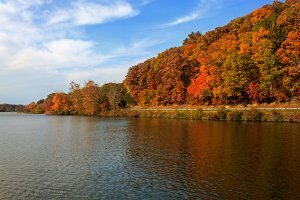 Abandoned mines, ancient mounds and beautiful scenery provide incredible opportunities for hikers, photographers, nature lovers and historians alike at one of Ohio’s most historic and scenic state parks. 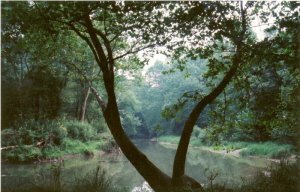 Clear Creek Metro Park features over 5,300 acres of woodland interspersed with blackhand sandstone cliffs, ravines and creeks and is home to more than 2,200 species of plants and animals. Forested areas range from Canadian hemlocks and ferns, to oak and hickory, to Ohio’s last remaining colonies of rhododendron. Twisting park and forest roads pass through 604 acres of deep ravines and dense woodlands at Tar Hollow. Scattered shortleaf and pitch pines growing on the ridges were once a source of pine tar for early settlers, hence the name Tar Hollow. Dogwoods, redbuds and a variety of wildflowers color the hillsides in the springtime. Fall’s pageant of color is spectacular. 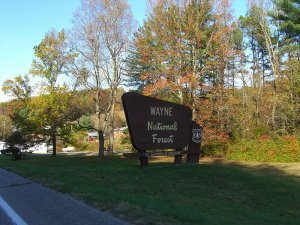 Discover the wonder and beauty of the Wayne National Forest. Tucked away in the Appalachian foothills, you’ll experience the natural beauty of wildflowers, rocks formations, trees, butterflies, and abundant wildlife. There is plenty of recreation including ATV/OHV, horse, and mountain bike trails, camping, hunting, trapping, fishing, hiking, and more. Download the Official Hocking Hills app for hiking trails, driving directions, local businesses and more.